The Hurtigruten MS Midnatsol lives two lives at opposite ends of the earth. The ship is a coastal liner sailing along the scenic western coast of Norway in the summer months of the northern hemisphere. The Midnatsol then moves to South America and Antarctica to sail in this southernmost region of the world during the austral summer months. 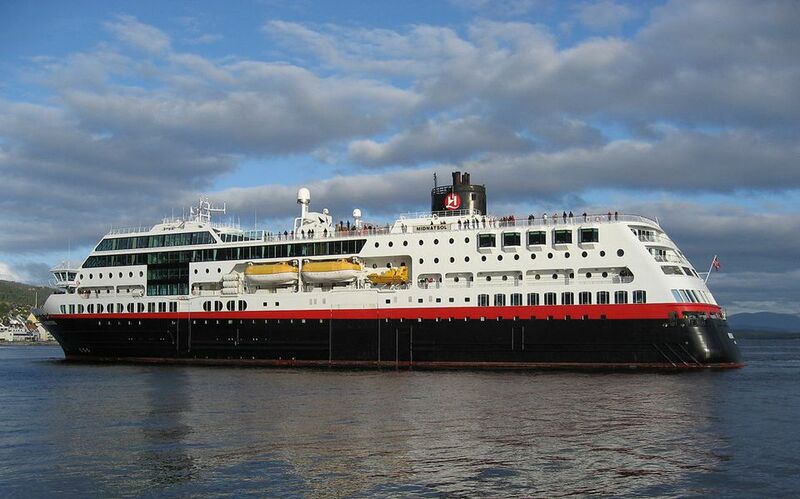 The Hurtigruten MS Midnatsol coastal liner has 298 cabins and suites with 638 berths. This fascinating vessel has features of a cruise ship, freighter, and a passenger/car ferry in Norway and an expedition ship in Antarctica and Patagonia. This ship is both a cruise ship with overnight accommodations and a ferry for those traveling along the western coast of Norway. In addition to the overnight cruise passengers, this Norwegian coastal liner also can carry another 300+ day trip passengers, along with tons of cargo and 45 cars. When the ship is in the southern hemisphere, Hurtigruten transforms it into an expedition ship. The storage area for cars is used for the Rigid Inflatable Boats (RIBs), kayaks, and other expedition equipment. The cabins stay the same, but the ship carries less than 500 guests. The Ocean View cabins on the Midnatsol vary in size from 86 square feet to 140 square feet. This Category U cabin in the photo above has a refrigerator, but many do not. The Ocean View cabins on the ms Midnatsol have basic accommodations--bed, small bath with shower, chair, and desk/vanity. The bathroom has a heated floor, which is delightful to have in any hemisphere. Not only does the heated floor keep you warm, it heats up the bathroom enough to dry out any wet clothing you have hung on the clothes line in the shower. The bathrooms in all the cabins (except the mini-suites and suites) are almost identical, so this shower is representative of the ms Midnatsol. It has a clothes line for drying wet jackets or pants. There's not much space around the sink, but the bathrooms on the Midnatsol have a spacious cabinet over the sink that will hold all the make-up and toiletries of two people. The Mini-Suites on the MS Midnatsol range in size from 194 to 215 square feet. In addition to the bed, chairs and table, and wonderful large round portholes, the ms Midnatsol has a vanity desk, sofa, and private bath. This sofa bed and table and chairs make a nice sitting area in the mini-Suites of the Hurtigruten ms Midnatsol. The Midnatsol Mini-Suites have this spacious sink area in the bathroom. With this corner bed, guests can wake up and peek outdoors. In the summer, the room darkening curtains really come in handy since the sun doesn't set until after midnight (if at all). The 10 Grand Suites on deck 8 of the Midnatsol do not have a balcony, but they do have a bay window and sitting area. The Grand Suites have a larger television and a nice entertainment center. The Grand Suite on the Hurtigruten ms Midnatsol does not have a balcony, but does have this marvelous bay window. The Midnatsol Grand Suites have a large tub with separate shower. The Grand Suites on the Midnatsol measure a generous 377-398 square feet and have a large balcony, separate sleeping area, and sitting room. Only a few accommodations on the Midnatsol have balconies, but those that do enjoy large ones like this! The inside cabins on the Midnatsol vary in size from 65 square feet to 108 square feet. These basic accommodations are tiny but have the same size bathroom as the larger outside cabins. The Midnatsol has 4 handicap-accessible cabins on deck 6 near the elevator. This one is #619.